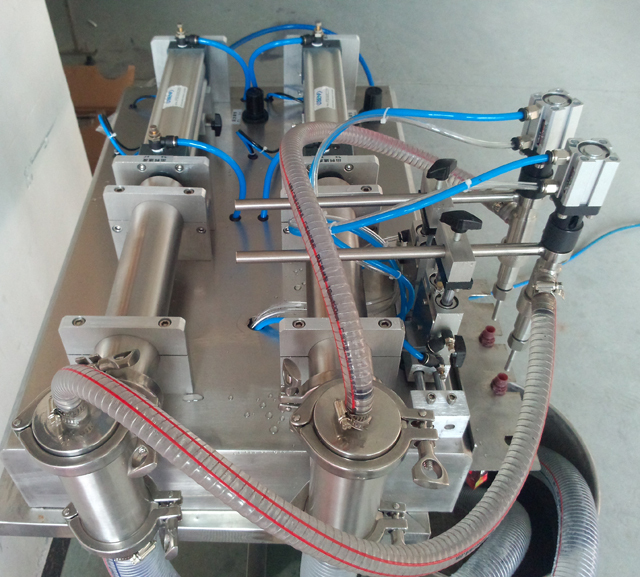 This semi-auto piston type filling machine based on the reference of the foreign similar products, is a new design added some additional functionality .it makes an easy job and convenient for the operation, accuracy error, filling volume adjustment, machine cleaning and maintenance. 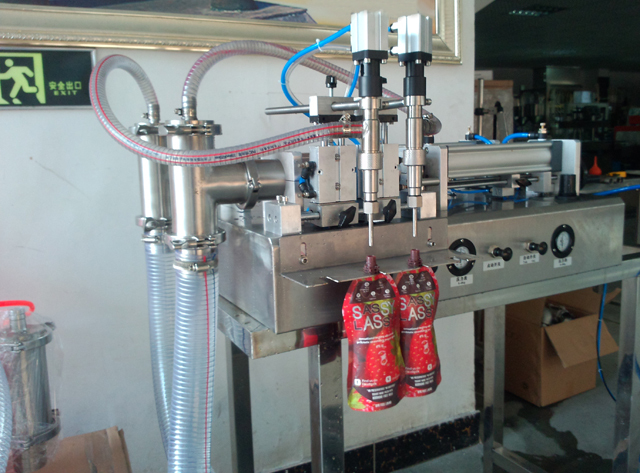 The design of this pneumatic filling machine adopts the pneumatic components instead of the electrical controlling circuit, so it is suitable for the use in the environment with the explosion-proof requirements. 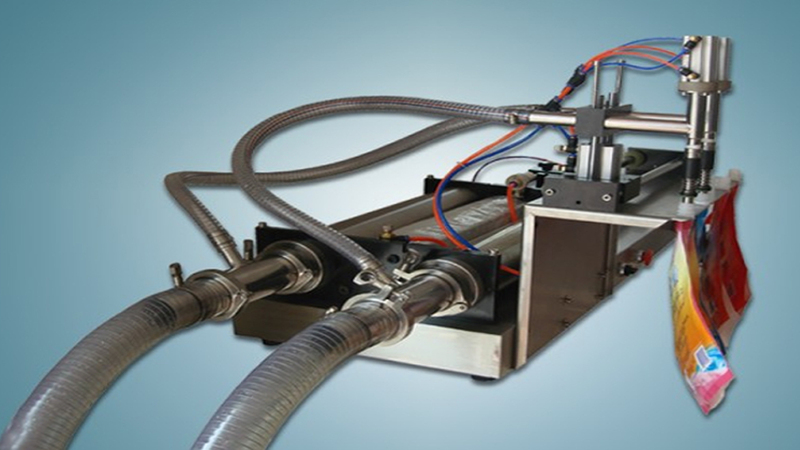 The machine model selection is concerned with the maximum filling volume requirements. The pushing and pulling of the air cylinder，it drives the cylinder piston do the reciprocating motion, which makes the material cylinder to generate the negative pressure. When the cylinder is pushed forward, it pulls the piston to the back, and inside the material cylinder, the negative pressure absorbs the material into the inlet pipe from the material hopper. 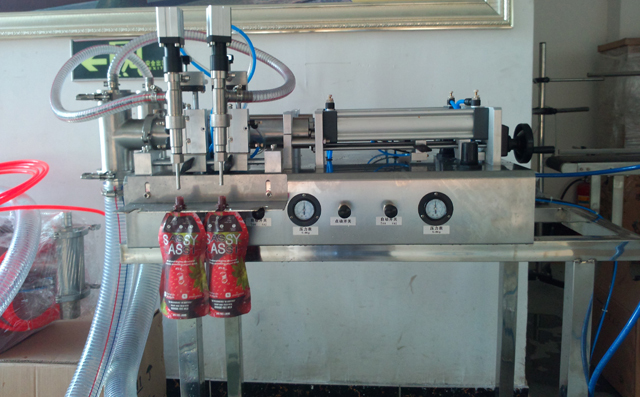 This piston type filling machine is a single, simple mechanical action for the each filling , so it has a high filling accuracy and stability for standard container. A. The machine uses the compressed air the for controlling, it has high safety especially suitable for use under the explosion-proof requirements. B. 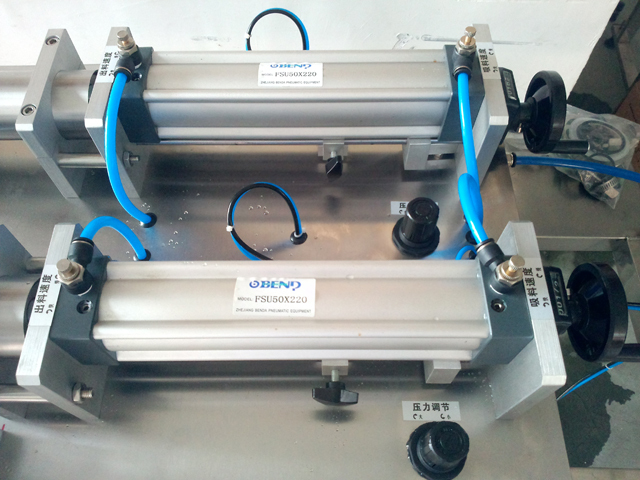 It won't generate static electricity and hemp electricity phenomenon;the machine does not need to connect the grounding wire. D. In the case of emergency stop, you just need to turn off the pneumatic switch, the piston will be pulled automatically back to the starting position, and the machine will stop filling. Take the inspection before starting the machine, this can be avoid the mechanical failure or personal injury accident. A. The clamping handle of the front and behind, is it clamping tight of not? B. The three-terminal clamp of the inlet and outlet, is it fixed or not? C. The filling head and its horizontal, vertical lever, is it clamped? 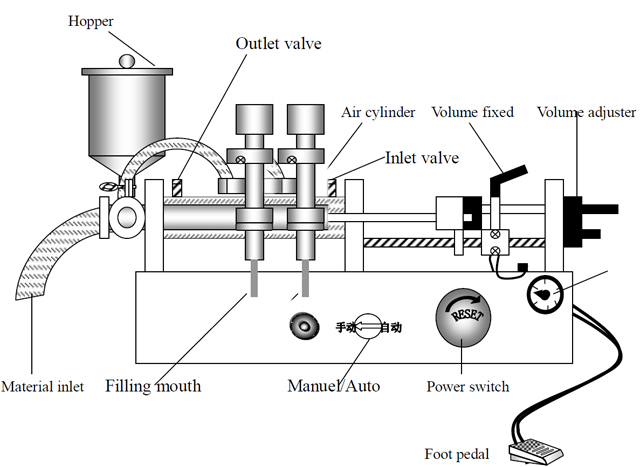 D. Connect to the air compressor machine, the pressure is less than 8�K/c�O, pressure adjustment is about 4-5 �K/c�O. E. Turn on the air supply switch. 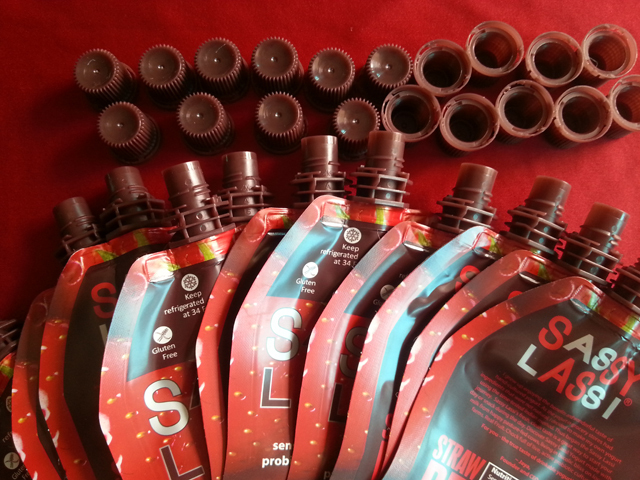 The filling volume adjustment is depends on the filling materials, liquid (ml) or weight(g), because the proportion of materials is different, also, the measurement data is different. So, for setting a required precision filling volume , please adjust the Volume adjuster. A. General adjustment: For a satisfactory filling volume, please adjust the adjusting screw gas switch, move the position to the left or right. C. if there is any filling error, please adjust the volume adjuster, move it forward for the filling volume reduction, and backward is volume increasing. D. For a required filling volume and precision, please do repeated adjustment until the filling volume is standard. A. The absorbing speed of the filling materials is depends on the material viscosity and the length of the absorbing pipe. B. The filling speed is depends on the diameter size of the filling head, the more bigger diameter size the more faster filling speed . C. The foaming degree of the filling materials, if the foaming degree is higher , the filling speed should be slow down. D. Filling volume, more filling volume more slowly. 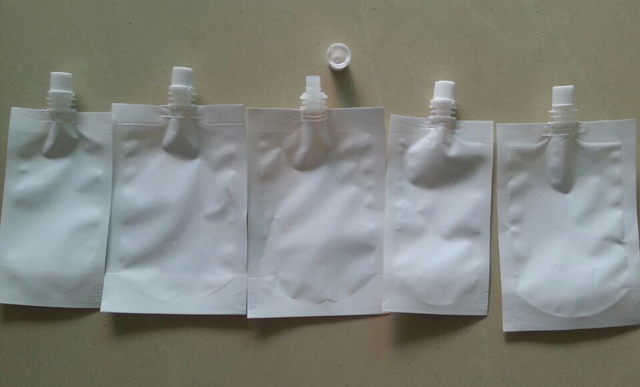 E. Filling volume precision, high accuracy and filling speed should be adjusted slowly. F. The valve controller of the air pressure. B. Turn the front valve handle clockwise, the speed of the cylinder go forward slow down, also, the speed of the materials absorbing will slow down. C. Turn the front valve handle by counter clockwise rotation, the speed of the cylinder go forward getting faster, also, the speed of the materials absorbing will getting faster. D. Turn the back valve handle clockwise, the speed of the cylinder go forward slow down, also, the speed of the materials absorbing will slow down. E. Turn the back valve handle by counter clockwise rotation, the speed of the cylinder go forward getting faster, also, the speed of the materials absorbing will getting faster. 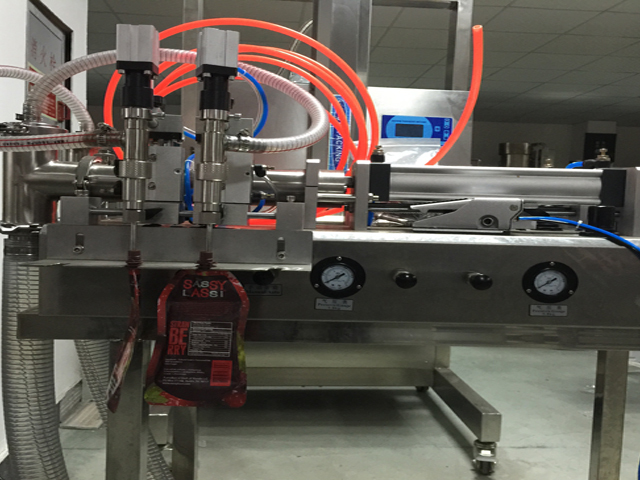 The reason why the machine has the filling error is because it has so many influencing factors, like filling volume, filling speed, and speed of the valve switch. The speed of the valve switch is affected by the viscosity of the filling materials, the larger viscosity as well as the slower speed .The adjustment is simple by adjusting the main valve spring pressure, and the speed will be accelerated by more and more pressure. The Adjustments of the spring pressure for the measuring and filling depends on the personnel experience of the operator. Before the cleaning job, make sure the compressed air is off. 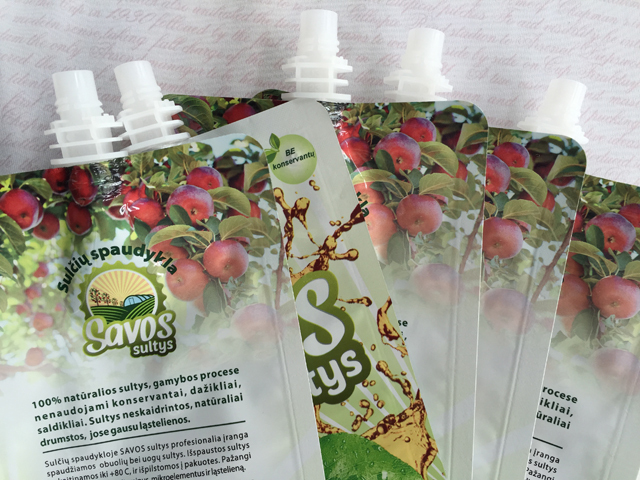 It is forbidden to use organic solvent for the cleaning, such as petrol, benzene, ethylene, sodium hypochlorite etc. After the the cleaning job is finished, please wait and make sure all the cleaning parts is dry without water and foreign objects in the joints&pipes, then install the machine. Make sure the air pressure is on. Make sure the air pressure valve is on. Make the air source switch is on, no stuck pressure on the pneumatic valve. Make sure the valve is installed correctly. Make sure no sticky and bunged up for the piston head. Make sure no damaged switch of the air pressure. 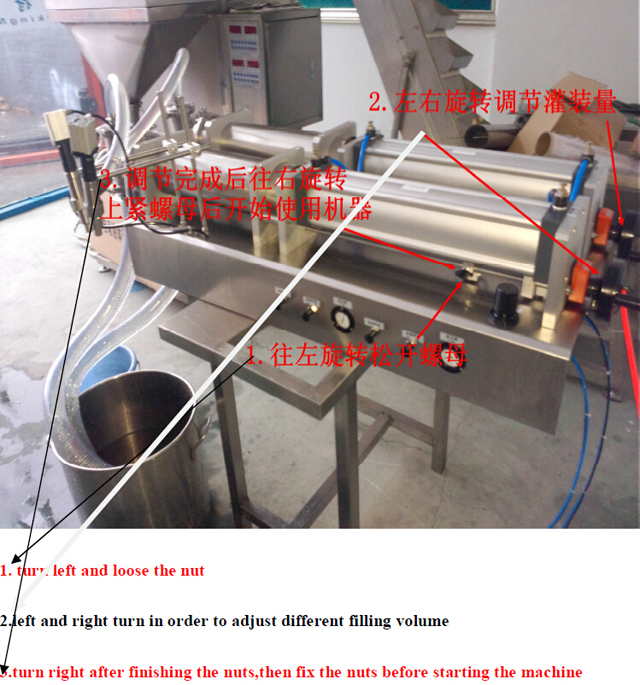 The larger viscosity filling material, the filling speed should be slow down. Make sure there is enough material inside the hopper and material tank. Make sure the material hopper and volume switch is tied tightly. Check the sealing washer, if it is damage, change to the new one. If the material is thin, please use two sealing washer. Make sure the absorb cylinder is installed correctly. Make sure the pipe is tied tightly. Make sure the absorb pipe head is inside the material tank. and the air valve adjustment should be let the filling smoothly.